KOSHTAY, Garmsir District, Helmand Province, Islamic Republic of Afghanistan – The mission for Marines here is to seize ground controlled by Taliban insurgents, hold that ground and build on it. Building in this case means fortifying their exposed position on the very front lines of this conflict. However, Marine infantrymen are not known for their carpentry and construction skills. That responsibility falls on the engineers. 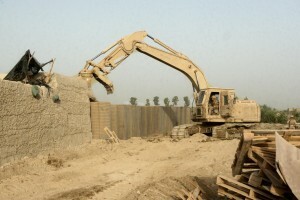 Marines from 1st Combat Engineer Battalion, Combat Logistics Battalion 8 and 8th Engineer Support Battalion rolled out in a 20-vehicle convoy full of heavy equipment and building materials, Aug. 16, to construct a semi-permanent position for Company G, 2nd Battalion, 8th Marine Regiment, which often receives enemy fire. “This will provide Golf Company an overwatch for their resupply routes,” said 2nd Lt. Mark H. Tetzel, platoon commander with Co. D, 1st CEB. It has been difficult to get supplies to Co. G’s position since they arrived here in early July. Overwatch will give the Marines a better vantage point to scan the area for approaching enemy fighters or IED implanters. Construction started immediately upon arrival late in the evening and continued round the clock. The engineers’ built two observation posts, Patrol Base Khanjar and Combat Outpost Koshtay, as well as a medium girder bridge. These builds include creating a berm, filling metal, mesh barriers called Hesco with dirt, and constructing security posts high on the walls. While they were in the area, they also repaired a damaged culvert along the resupply route to allow provisions to safely arrive at Co. G’s position. Changing the subject for a moment, after observing that the Army had “negotiated” with the village elders for almost one year, while the elders were under constant threat from the Taliban who were watching for any sign of collusion with the U.S., please recall what we said about the Army approach to VPB (Vehicle Patrol Base) Wanat, and Observation Post Top Side. We also pointed out the same thing in Opening a Combat Outpost for Business. Subsequent commenters have weighed in saying that the difference between the Farah Province and Wanat makes this comparison (or contrast) irrelevant. Wanat was logistically difficult and the terrain forbidding, and so there is nothing to be learned from the lessons of the Farah Province, or Anbar, Iraq, for that matter. I don’t think so. There is much that can be learned, and terrain wasn’t the point. Terrain may have been more difficult at Wanat, but however long it took to construct the VPB is however long it took. While better logistics should have been pursued, the real problem was that the locals were courted at Wanat for 11 months to get their approval for a VPB, while the Taliban had time to deploy in force to kill American troops. In the Farah Province and at Garmsir, the Marines did it around the clock and didn’t ask for permission from the locals or anyone else. This is the way it should be done – quickly and in the backyard of the insurgency. There is another lesson learned from all of this. Contact with the locals and the enemy is a requirement for good counterinsurgency, and the Marines will do this all day, every day. But that doesn’t mean that we can jettison the doctrine of force protection. Rather than sitting at the large bases, the forces should be in the field like the Marines at Now Zad. But the Marines in Now Zad are in hobbit holes at night protecting themselves and their fellow Marines. Force protection is a fundamental doctrine that, if lost, will tell the sad and unecessary tale of men lost.